I’m not a big fan of putting text into paintings, but doing so has made this current section – the “hotel” section – of the ongoing $100 USD series seem somewhat sequential. When I first added the hotel sign I wondered if viewers might jump to the equation “woman + hotel = prostitute” and so, I was thinking about that as I painted and posted them. I’m not accusing anyone else of coming up with that, but I know I did. In that sense, the “hotel” paintings became political as I pondered the existing overarching urge to lump women into sexualized situations – and, in my case, to wonder if that was happening to images I generate. For many women, their sense of responsibility to not give the wrong impression manifests every time we get ready to leave the house, to go out in public. 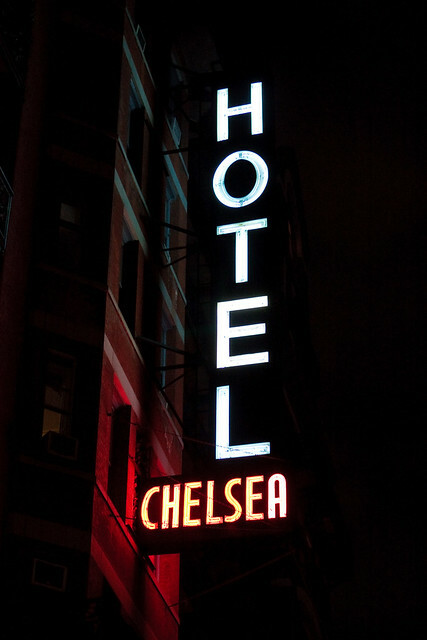 The “hotel” signs are versions of the Chelsea Hotel / Hotel Chelsea sign in New York, implying that the women are poets, painters, musicians – artists of some kind. Not hookers. I don’t expect the sign to do that job though. The paintings are more about the nature of assuming a sexual premise. When the baboon arrived, things started getting sequential. Up until that point, the paintings – all 200 of them – have seemed like individual takes that I exhibit one after another on FB as they are completed as opposed to all together in a RL gallery. In my mind, the sequential sensibility of an ultra slow-moving, not necessarily linear feel of a graphic novel arrived with the inclusion of text and the positioning of the baboon in front of a “pizza” sign that resembles the “hotel” sign. To me, the baboon (a “he” it seems) appears to be in the vicinity of the hotel on that same night. For this “story” I’m not overly concerned about beginning, middle and end. It’s more Hopper than Spiegelman. More about unique interpretations of a possible story told across many frames over a long time than Art Spiegelman’s “Maus” story for instance. I say Edward Hopper because he visually chronicled scenes with people that stand alone, but, as they amassed over time, also suggest broader stories within an era. There may even be one story there. Much of Hopper’s oeuvre (can’t believe I’m using this word… doh) feels like a hypothetical (non-existent) Raymond Carver set of short stories about various characters settling into short-lived, but highly-nuanced in-between states of reflection and waiting before and / or after action. I’d done a few baboons when I started the “hotel” paintings and when I did “Baboon #3” (below) I was going to add a “hotel” sign, but that seemed to imply that the crazy baboon might pose a threat to the women who had been standing in the same spot. So I made it a pizza sign and followed up with a woman in that same spot. As if to say, she was there after the baboon. Where is the baboon now? Where are the women? Are the women in danger because they are women and because the baboon is a baboon and there is a hotel and pizza? Are the women frightened, hiding in the hotel? Or on the streets, hungry for pizza? And now the fox (who I want only to be “Not Baboon”) seems to be playing a role, turning it into a fable of sorts: clever as a fox or like a fox guarding the hen house? I have at least two more “hotel” paintings coming up – both of women – but the baboon may finally appear outside the hotel too. Did anyone else get a sequential thing happening? Or maybe I just like the word sequential. Perhaps I’ve said too much! GIFTS: paintings can be gift-wrapped and sent with a handmade card (no extra charge). VOUCHER: I can send a handmade card with the news that the recipient can choose a painting. SPECIAL: $100 USD paintings dated prior to November are now 3 for $275 USD with FREE shipping (to a single address // $10 USD for additional addresses). Can be wrapped and sent with a card. CONTACT: me by email with any questions! “Baboon” sold in 25 minutes from my FaceBook page at the end of October. It got a record number of “Likes, Wows and Loves” (200+) and comments (40). I was standing at the back of the Wonder Ballroom in Portland when The Julie Ruin’s keyboard player Kenny Mellman started talking about Mecca Normal between songs, saying we’re his favorite band. When he finally let Kathleen Hanna talk (at 1:20 above), she said, “Jean Smith is a great painter!” She also told the audience to follow me on social media. So… “Friend” me on FaceBook to catch the $100 USD paintings as they are posted. It was so great to open for The Julie Ruin in Vancouver, Seattle and Portland!